The day in 2009 that C-SPAN’s Book TV went to Annapolis to interview Eva Brann, the Blue Angels were performing there for the U.S. Naval Academy’s commissioning week. At about the 16:15 mark in the interview, Brann, a former dean of St. John’s College and recipient of the National Humanities Medal, is discussing her long career when the Angels buzz her book-packed little house, shaking the place a bit and briefly halting the conversation. If the interview had not been real life but fiction, this little moment could not have been better scripted. It is quite the Platonic literary detail, in the strict sense. Plato liked to anchor his dialogues in time and space with ostensibly incidental moments. In the Republic, for example—a book about regimes—the characters meet at a novel religious festival being held in the neighborhood most friendly to Athens’ democracy. Among the important contributions of Brann’s scholarly career has been her insistence on appreciating Plato as a writer who intends such details to have meaning. Had the C-SPAN interview been such a scripted work of fiction, the meaning this interrupting flyby would have borne would no doubt have been to emphasize the role that the United States has played in Brann’s life and work. Born on the outskirts of Berlin in 1929, she fled to America with her family as a girl, first packed onto a sealed train car bound for Lisbon, and then on to Brooklyn aboard a ship chartered by the Jewish Joint Committee. Trained at Yale as an archeologist, Brann wrote one book on the subject before giving it up for the more peripatetic intellectual life of a tutor at St. John’s, known for its "Great Books" program. Umpteen books, articles, lectures, and students later, when I arrived on the campus in 1999, some undergraduates thought they had detected a disturbing change in her tone. The politics of St. John’s students in those days tended to range from apathy to conventional center-leftism (I was no different) and following a lecture on William H. Prescott’s Conquest of Mexico, in which Brann had rather bluntly addressed how the strength of the conquistadors and the weakness of the Aztecs were related to the Western modes of thought of the former, the reviews on the quad were not good. Maybe it would be better to stick to Plato and the philosophy of the imagination, and leave history and politics to others with more bien-pensant instincts. Maybe, it was quietly suggested, she was starting to lose it. Since then, Brann has published (by my count) seven new books, if you include translations. The latest, Then and Now—a linked pair of essays on Herodotus and conservatism—shows no sign that Brann, nearing her 90th year, is losing it, though it does provide abundant evidence that she still doesn’t care very much for modish thought. Indeed, as undergrads, I think we missed the fact that she never really had. Brann is comfortable writing seriously about things like national character, national or ethnic "types," and even the relative greatness of nations. Considering that the consensus of today’s universities holds the concept of a "nation" to be a false if not a dangerous category, it’s safe to say that Brann’s politics are not exactly in the academic mainstream. Brann’s habits of thought are also not in that mainstream, which tends to wash scholars downriver into delta swamps of hyper-specialization. In Brann’s essay on Herodotus, one encounters asides on how Fitzgerald cribbed the diction of the story of Kleisthenes for use in The Great Gatsby; the relevance of the Histories to Cavafy’s "Waiting for the Barbarians" and to the argument of Federalist 63; and explanatory recourse to Euler diagrams. The cleverness of these leaps of association may remind some readers of other postmodern polymaths like Guy Davenport, though Brann is less ostentatiously pedantic, and working on a somewhat deeper level of analysis. So this Athenian Odysseus is like his model not only in being a versatile man "of many turns" … but also, as the Homeric Odysseus never met a woman he couldn’t (and wouldn’t) charm, yet was, even in his wanderings, true husband only to one, Penelope, so Themistocles, who could make himself useful anywhere (and did), was a true citizen of Athens to the last. Hollywood romcoms have been produced on flimsier premises. 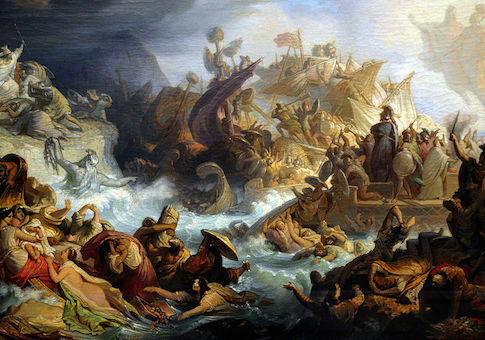 Brann suggests that Herodotus was engaged in a self-conscious competition with Homer over whether epic poetry, or a newer form of human inquiry into the past—dubbed "history" by Herodotus—was superior. Herodotus’ new genre was more-or-less equal parts travel writing, investigation into what today we would call "historical causes," narrative non-fiction, and anthropology. In Brann’s telling, it can sound a great deal like journalism. What Herodotus’ book was not, she argues, was haphazardly cobbled together. Resisting another trend of modern scholarship—the tendency to assume inattention or inadequacy on the part of authors, and to seek philological explanations for difficulties in the text—Brann makes a case for the necessity of Herodotus’ extended descriptions of Egypt and Scythia as central to his project: the showing-forth of the greatness of Greece, and especially of Athens, through demonstrating what Greece and Athens are not. Brann, who in her youth at St. John’s worked under the influence of Jacob Klein, a friend and peer of Leo Strauss, tends towards the syncretic in her interpretations, which tend to leave the reader feeling inspired and edified at their conclusion. A critic might point out that this sort of thing runs the risk of turning interpretation into poetry. Though Brann’s method of reading is clearly related to that of the Straussians, with their focus on structure and their assumption of logographic necessity in the writings of great authors, she has always manifested less of their darkness and sense of the tragic, not to say their prioritization of political philosophy. As was the case with Klein, the philosophy of the unseen has been Brann’s true interest—the worlds of images and mathematics, of ontology, and the wonder inspired by such inquiries, and by the moments that suggest their needfulness. Brann’s politics, which she explores in the second essay of the new book, and which she labels "imaginative conservatism" or, as a crib, "modified Burkeanism," are unconventionally described, but not necessarily unconventional in themselves. (Brann is also now a senior contributor to the Imaginative Conservative, a website which years ago borrowed its name from Brann’s writings.) She expresses affection for Madison in addition to Burke—whom she criticizes for being leery of "philosophy" when what he meant was "ideology." Brann’s conservatism is not a partisan affair, and is not particularly concerned with the dangers posed to Madison’s constitution by modern liberalism. She is the kind of conservative who voted for Barack Obama twice, and who deplores the late gridlock in Congress. If the Greeks had lost here…[w]hat great and wonderful works would then have come to be in Europe and its America? Probably not these: science and democracy. For the Persian bequest to Europe, the one that would have aborted the Greek legacy we actually live off, would have been the religion, not the science, of nature, and the institution of despotism, not of freedom. Herodotus, in Brann’s reading, celebrates Athens for its quintessential Greekness, and finds its greatness in its science and freedom. Brann herself admires America for its quintessential westernness, for the way its politics allow for science to flourish—and for the greatness that allowed it to provide a place of refuge for a young Jewish girl who fled a tyrant, then spent a lifetime investigating, and delighting in, her sense of wonder.